Hardly known today, Françoise Petit died only last year (2015) aged ninety. She was born in Paris in 1925, an alumna of the Paris Conservatoire, where she studied piano with Jean Doyen, and harmony with Olivier Messiaen. She later took harpsichord lessons with Rugerro Gerlin, a pupil of Wanda Landowska. There’s not much of her recorded legacy available; I could only find a CD of piano pieces by Louis Durey on Calliope (CAL1815), so this recent release from Forgotten Records is all the more welcome. An LP entitled ‘Pièces pour clavecin’ by Jacques Duphly showcases her harpsichord skills. As far as I know it has never been transferred to silver disc but has been posted on You Tube, and is worth a listen. 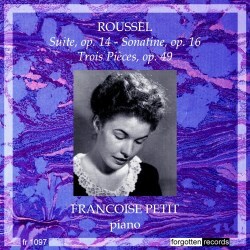 I’ve never heard any of Roussel’s piano music before but what we have here seems to be a blend of impressionism and the neo-classical with some lush chromaticism thrown in for good measure. The earliest and most extensive work represented is the four-movement Suite Pour Piano Op. 14, from 1909-1910. Each movement has a strongly distinctive character. The Prélude begins dark and gloomy, building to a turbulent climax, then subsiding. An element of calm is introduced in the Sicilienne. The Bourrée is fairly astringent and proudly flexes its muscles, whilst the concluding Ronde delights in its capriciousness. Petit serves up a varied cocktail, with playing oozing with personality. The Sonatine, Op. 16 dates from 1912 and is condensed into two movements. The first is lively and upbeat, with echoes of Debussy in its impressionistic disposition. Petit’s assured technique guarantees that the coruscating finger-work is brought off with dazzling perfection. The second movement begins slow, pensive and brooding. Gradually the tempo becomes more animated and the work ends in a rhythmically audacious whirlwind. We jump to 1933 for the Trois Pièces Op. 49, dedicated to Robert Casadesus, who gave the first performance. The opening movement is neo-classically cast and one is reminded of Stravinsky by its rhythmically percussive angularity. The waltz-like middle movement offers some contrast before a vivacious finale, with jazz-inflected rhythms. Here Petit’s confident and assured playing secures some favourable results. The recordings have been faithfully transferred from a good quality LP (L'Oiseau-Lyre ‎– SOL 60052). Notes in French supplied by Denis Havard de la Montagne, courtesy of musimen.com, provide a detailed biographical portrait of the artist.